Two protesters sustained injuries and 29 others were arrested when mayhem broke out at the King Dinuzulu Hospital after protesters forced their way onto the grounds of state medical facility in an alleged attempt to demand employment on Monday morning. KZN Health MEC Dr Sibongiseni Dhlomo has condemned in the strongest possible terms the actions of the protesters who caused damage to state property at King Dinuzulu Hospital in Durban. According to information reported by the Department of Health (DOH), protesters first tried to force their way into the hospital on Monday morning and, in the process, damaged a gate and also burned down a guard hut. “They also damaged the palisade fencing, and threw stones into the parking area alongside Howell Road, damaging two ambulances and a few cars that belong to staff. They intimidated staff and patients and, for some time, ensured that hospital staff and those seeking medical attention could not enter the hospital. The protesters were ultimately prevented by members of the SAPS from entering the hospital. But by 9am, order had been restored and the hospital became operational,” the DOH said. “The protesters, who are from a neighbouring informal settlement, did not submit a formal memorandum of grievances. However, it is believed that they are demanding that more people be employed by companies that are contracted to provide security, catering, cleaning and maintenance services at the hospital,” added the DOH. MEC Dhlomo has come out strongly against the actions of the protesters. “There’s no excuse for any person to raise issues in an unruly and violent manner such as what has happened. We would like to thank the SAPS for coming in to quell the situation. We are hopeful that they will do everything humanly possible to safeguard government property from thuggery and violent behaviour from people who want to raise issues in a violent manner. In a hospital, you cannot expect people to come in and burn buildings because they have a demand that they would like to be addressed, whether by the hospital or by the company that is providing outsourced services. We condemn this in the strongest possible terms. It’s like a person burning a school because they want a clinic to be built; or burning a clinic because they want a road. That behaviour is unruly, and we will not accept it at any given point,” he said. Police spokesperson, Col Thembeka Mbele, said, “A case of public violence is being investigated by Sydenham SAPS. On Monday morning at 6am, about 100 job seekers embarked in a protest action where they blockaded Stanley Copley Drive with burning tyres. 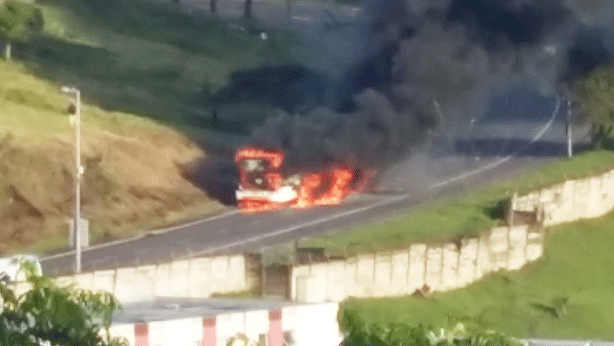 A municipal bus was set alight and an ambulance was damaged during the violent protest. The police had to use rubber bullets to disperse the unruly crowd. 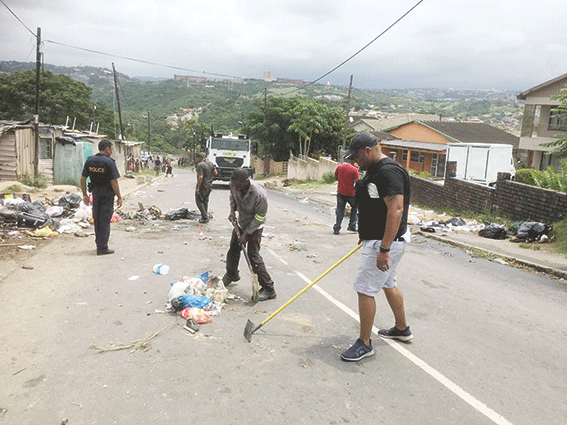 Meanwhile protest action continued unabated in the Palmiet Road vicinity on the weekend with protesters blocking off the roadway with rubble, blocks, branches and a portable toilet that was also set alight. Clare Estate Action Committee (CEAC) chairman, Vincent Chetty said, “CEAC members together with KZN Community Crime Prevention Association (KZNCCPA) patrollers, SAPS POP and Metro POP cleared the roadway for residents and motorists. Many of the municipal water meters leading to the homes were damaged by protesters. SAPS made numerous arrests related to the protest.